For the cargo ship, see MV Armathia. 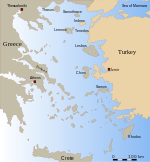 Armathia (Greek: Αρμάθια) is a Greek island belonging to the Dodecanese group in the eastern Aegean sea. It is part of the municipality of Kasos. In the census of 1951 there were 8 recorded inhabitants but it has since become uninhabited. At its peak it sustained a community of over 100 which were mainly involved in mining the rich deposits of gypsum intended for export. It is now a tourist destination for day trippers from neighbouring developed islands. The recently constructed observatory attracts wildlife observers. This page was last edited on 12 March 2019, at 01:10 (UTC).